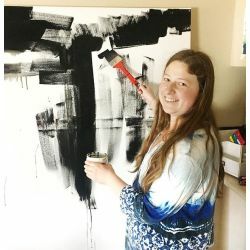 "I CREATE BOLD AND BEAUTIFUL ART THAT BRINGS YOU JOY AND ENCOURAGES YOU TO BE AND LOVE YOURSELF." I began painting in 2015 as a reprieve from stress during my dissertation in graduate school. It was then I realized that I could better express myself with a paintbrush than with words. Before that, I truly thought writing was my favorite means of expression. Using painting to express myself has lead me to be more confident in my skin, and accept myself for who I am. I feel that art has set me free in a way, allowing me to be authentically me all the time. In the world of art, you are unique if you stand out, and I’ve always felt different and weird my whole life. Finally, a world where uniqueness was celebrated! The art community made me realize that being weird is beautiful. My work is bold and beautiful and my style is original. That’s something to celebrate! After I discovered my passion for painting I began practicing for at least 8 hours per day. I was able to become a part time professional artist in 2016 only after a year of painting, from dedication and practicing my craft. Truly proof that if you put your mind to it, anything is possible. I use art not only as a way to express myself, but also a way calm the noise in my brain from my OCD (Obsessive Compulsive Disorder) and Attention Deficit Disorder. Painting forces me to be in the moment with my intuitive process, allowing me to be completely absorbed in the process for hours at a time. Painting is soothing to me and each finished work will tell a story if you look closely enough. I was born and raised in Grosse Pointe, Michigan, but I’ve also lived and studied in San Francisco and the UK. I now call Ann Arbor, Michigan home. Go Blue!